Watched parking garage security cameras can protect residents, outdoor assets, and vehicles from vandals and thieves. One client benefited from their customized security solution. Trained monitors led police officers right to the perpetrators. At 3:43 A.M., a parking garage security operator saw two suspects loiter in an alleyway next to a parking structure. The parking garage is part of a residential apartment complex property in Seattle, Washington. The suspects had flashlights and a bag of tools. The parking garage security operator activated the on-site speaker. Both of the suspects remained at the multifamily apartment complex. The surveillance operator called the Seattle Police. Residential security operators watch for suspicious activity to help deter or prevent criminal acts such as break-ins, robberies, and vandalism. The surveillance operators use HD IP megapixel surveillance cameras to watch commercial and multifamily residential properties in real time. Indoor and outdoor security cameras can be placed at gates, alleys, fences, roofs, parking lots, fitness areas, laundry facilities, and other common areas of a multifamily apartment community. One of the suspects jumped a fence and squeezed between the roof and the parking garage door. 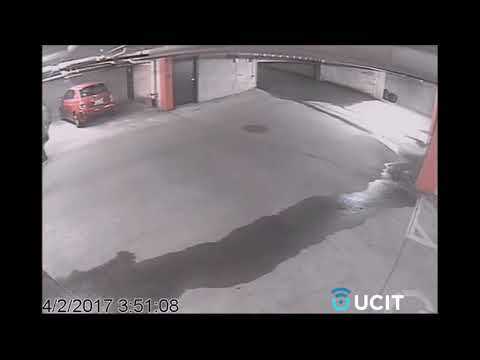 He hit the automatic garage door until it opened. He let his accomplice in. The surveillance operators followed their movements with the parking garage security cameras. Both suspects looked into several of the cars. One of the car alarms went off. A suspect ran away from the vehicle and left the parking garage. The parking garage security cameras showed Seattle Police at the residential property. They had one of the suspects in custody. One of the responding officers used a flashlight and looked into the parking garage. Seattle Police located the second suspect. The parking garage security video showed one of the officers take this suspect into custody and off the residential site.